I was lucky enough be again invited to join Ron H (aka Gentle) and his mates on another multi-day tour he’d organised. Gentle is absolutely brilliant at route planning, transferring the routes to gpx files and then sharing them to those in the group who have a GPS on their motorcycle. There were nine of us in total on a very diverse range of bikes. Actually there were a few “twos” – two Ron H’s, two identical Victories and two Harley Davidsons. 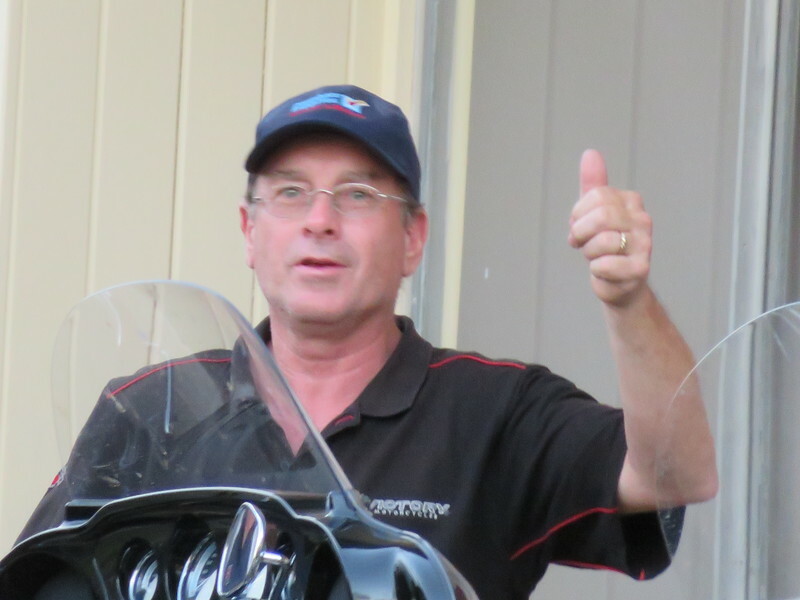 The rest comprised a Bontrike, A BMW R1200RT, a Suzuki V Strom, my Kawasaki and a brand new Triumph XR800. Everyone rode to their capabilities and to the road conditions and we had no dramas at all. The Geelong contingent met at a servo on the ring road and we just headed through Melbourne out to the other Ron H’s home at Kilsyth where we were all staying for the night. Many thanks to Ron for opening his home to the five of us from Geelong, plying us with Canadian Club and to two of his delightful daughters for making coffees, buying pizzas for us and generally making us welcome. We were all up pretty early, drinking coffee, loading gear on the bikes and raring to hit the road. 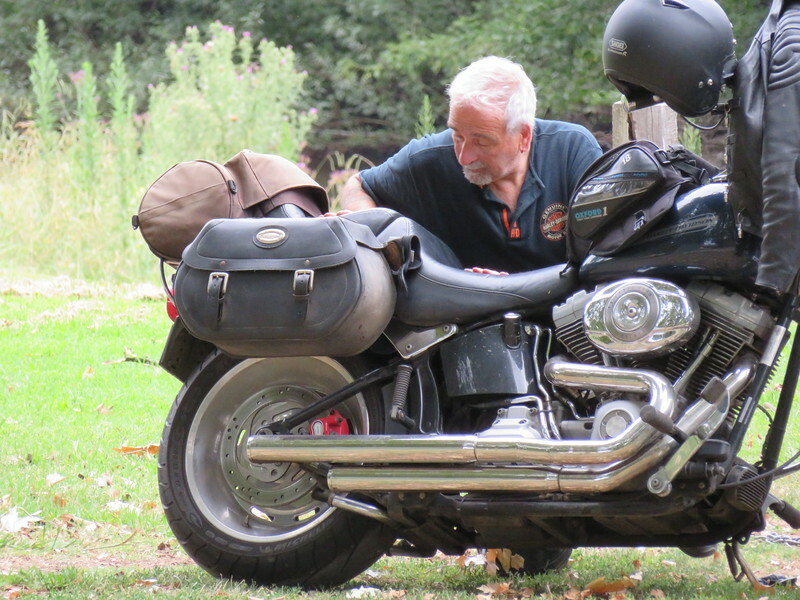 Peter soon rolled up and we then followed Ron H to a nearby bakery were we had brekky and rendezvoused with Max. 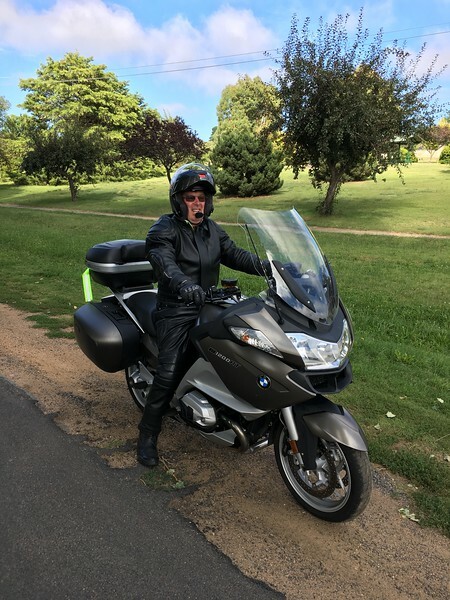 It was a beautiful sunny morning, around 23C when we headed out through picturesque Dandenongs out to Powelltown and then on to Moe, Sale and Bairnsdale via backroads. 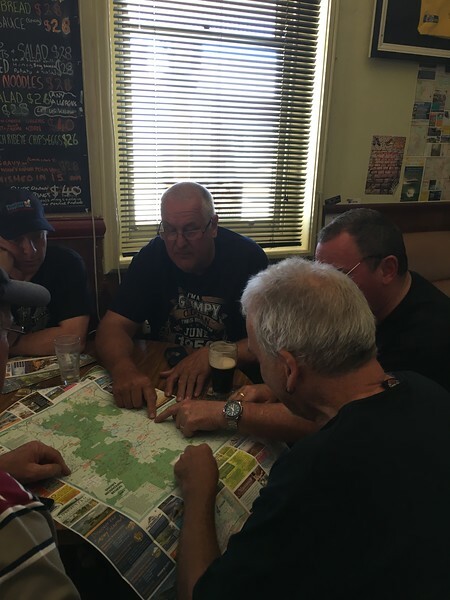 After a fuel stop in Bairnsdale we headed to Bruthen for lunch. It was hot and sunny when we fuelled up yet by the time we arrived at Bruthen a few drops of rain on the visor had turned into a short-lived torrential downpour. As we had lunch and sheltered from the rain, unbeknown to me a bee also sheltered in my helmet (hanging on the mirror). Unfortunately my head and the bee did not get on well and as I wondered for a moment why my intercom was buzzing, I wound up with a bee sting on the top of my skull! There was a stack of motorcycles at Bruthen including a large contingent of Harleys spotted at the pub as we left town. 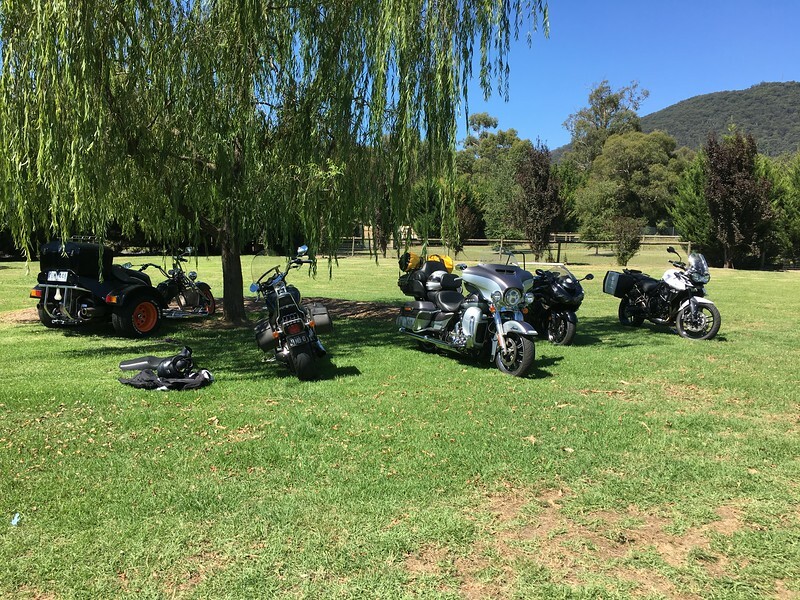 Below: some of our diverse range of motorcycles at Bruthen Lindsay’s trike – it’s cornering ability astounded everyone once we hit the twisty stuff! “Get off that phone Gentle”! 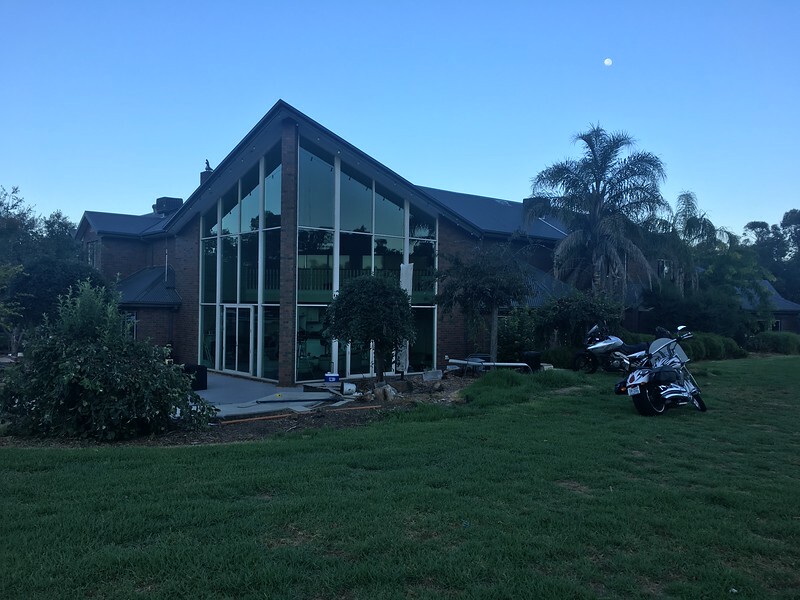 Gentle led us on a very relaxed run in dry conditions with a detour through scenic Lakes Entrance and then over to Orbost where we checked into the Orbost Club Hotel. I paired up to share a room with Jim C and warned him of ‘rumours’ of my snoring. 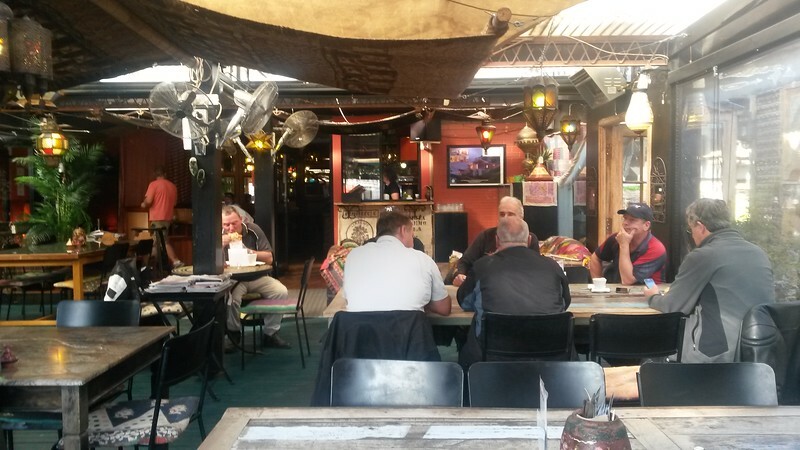 After a shower and a cleansing ale, some of us ate at the pub and others went to a nearby Chinese restaurant – everyone was satisfied with their meals. We actually ‘hit the hay’ pretty early. 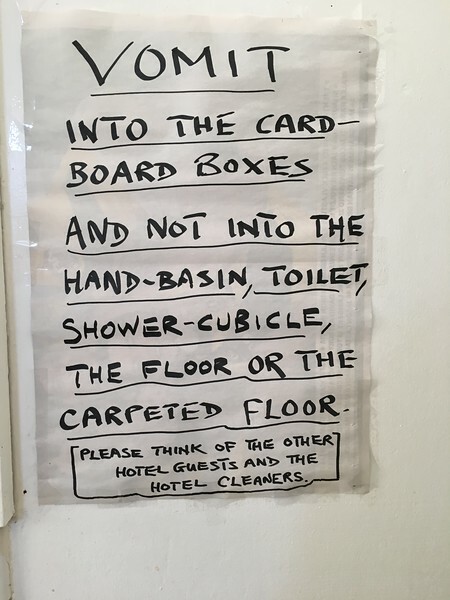 Whilst the Orbost Club Hotel was comfortable and clean enough, it had some signage that was quite extraordinary. I’ve stayed in some rough joints over the years, but I’ve never seen anything like this. Needless to say, none of their accessories were required by our crew! Then this ‘fella started up around 5.30am the next morning! 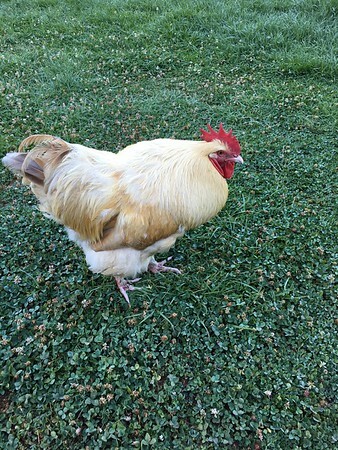 Yes, a pub with a rooster. We’d planned to leave around 8.30am but virtually everyone was up and ready to roll before that, so we checked out a little after 8.00am. I led off and from Orbost we headed along the Prince’s Hwy towards Cann River. The ride through this forested part of the highway was really enjoyable in the cool early morning air with virtually no other traffic on the road. 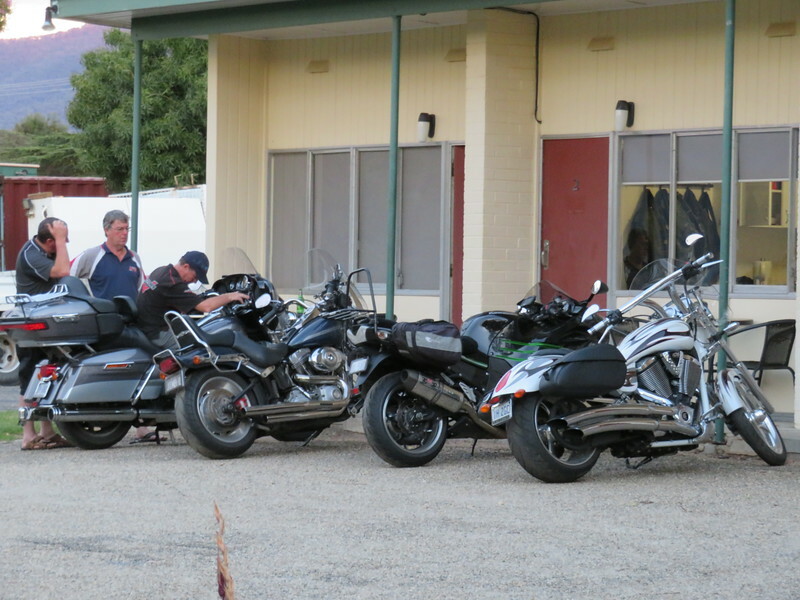 We fuelled up the bikes at Cann River and then headed over the road to a diner for breakfast. 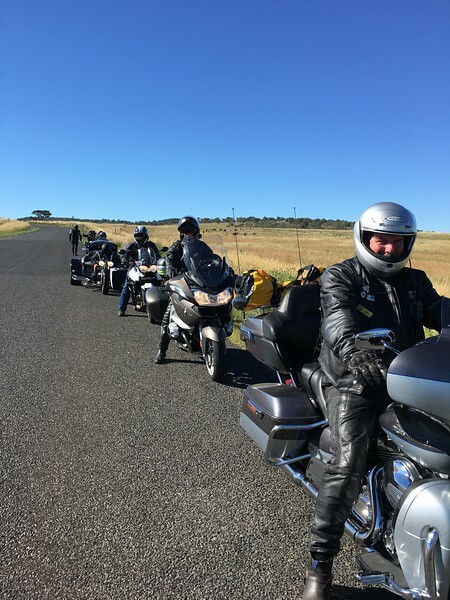 With the bikes and bodies fuelled we took off up the Monaro Hwy. I led off, followed by Lindsay. Once we passed a couple of cars we settled into a good pace through the sweepers. Even though it’s a highway, this section of the Monaro is a lovely ride. Every time I looked in my mirrors all I could see was Lindsay’s headlights blazing and a huge grin on his face as he hooked the trike through the twisty stuff! 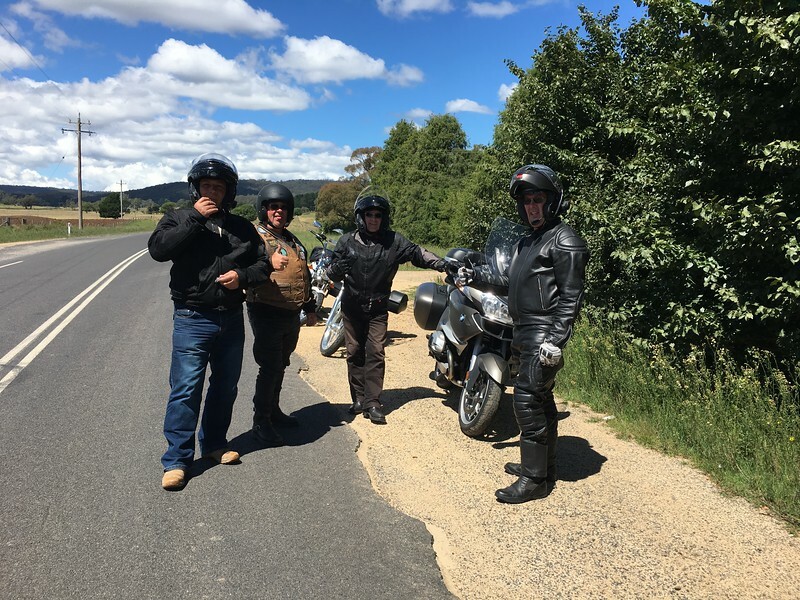 Once over the border into NSW we continued towards Bombala and then took a right turn up the Imlay Road. Again, this was a great piece of morning riding although we had to stop three times for roadworks. At one of the more lengthy stops I struck up a brief conversation with the lass on the Stop / Go sign. When it was our turn to pass she gave us a big grin and said to her colleague at the other end via her walkie-talkie “I’m sending my badass bikers through” – it kept me laughing for some time afterwards! We passed through Eden then on to Merimbula for a leisurely lunch. By now the sun really had some bite and there was barely a cloud in the sky. Gentle led off but once we hit the twisties of the Mt Darrah Road he flagged us to pass. Max headed off at speed and wasn’t seen again until the outskirts of Bombala. I took off next and couldn’t see any lights behind me for quite a few kilometres. It was a terrific run with lots of great corners, climbing from the coast up through the bush. Then I spotted a solitary headlight in my mirror, which got closer and closer – it was Ron H on the Victory and he was really hauling arse, I certainly couldn’t have shaken him! We pulled over when the road straightened and Max was waiting. 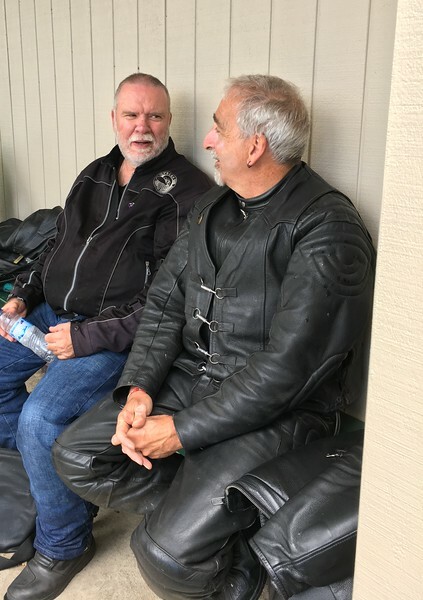 Ron and I ‘high fived’, celebrating sharing some great, but safe, riding at pace. 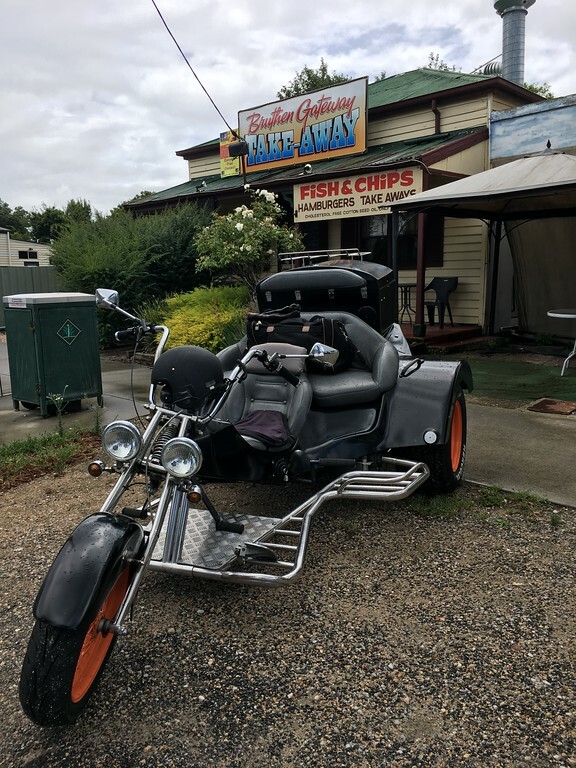 Congratulations Ron – you have the only Victory cruiser I’ve ever seen with no chicken strips on the tyres! The fast guys on the Mt Darrah road! Ron, Lindsay, Peter & Max. Gentle pointing out an optional twisty roads route for the next day. 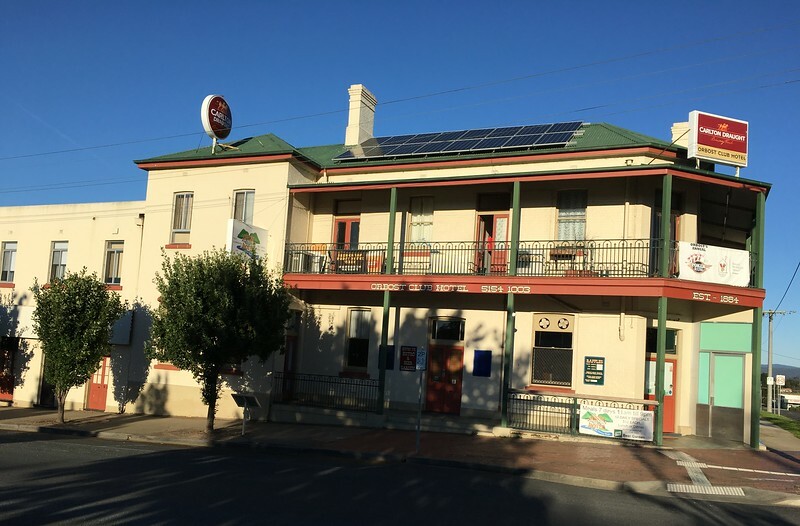 From here it was just a short run into Bombala and to our digs at the once majestic Imperial Hotel. Raconteur owner Steve welcomed us with plenty of banter and drinks to signal the end of a really enjoyable day’s riding in perfect conditions. 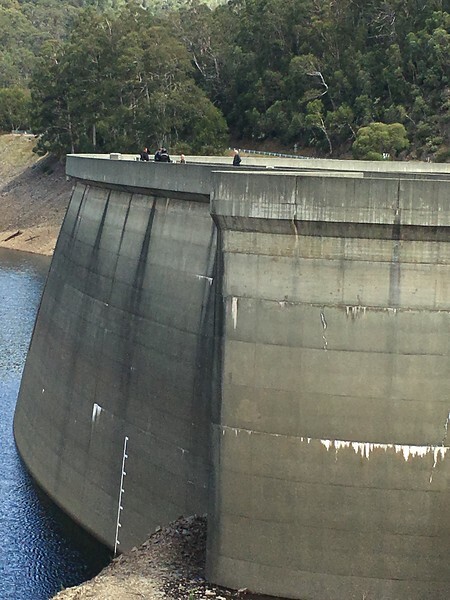 We settled in our rooms, several with dripping and running taps – there seems to be no shortage of water in Bombala! Steve took our meal orders early, and later proceeded to cook an excellent dinner for us all. My export quality steak from the local butcher was just sensational. Whether the lads had steaks, seafood of vegetarian pizzas – everyone rated their meal as 10 out of 10. As was the cooked breakfast we enjoyed the next morning, which in Peter’s case his doggie bag from brekky also provided his lunch, a very smart move. Doing what Gentle does brilliantly! Peter, Phil & Jimbo contributing to the routing plans. 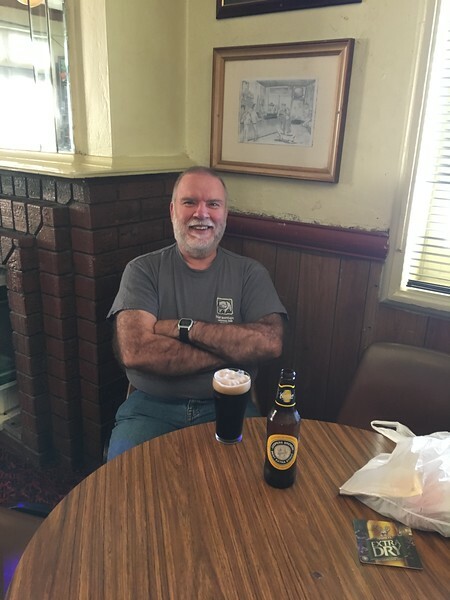 A rare shot of John with a stout – it’s usually a good shiraz! I slept most of the night with ear plugs in to prevent the sound of the dripping tap. 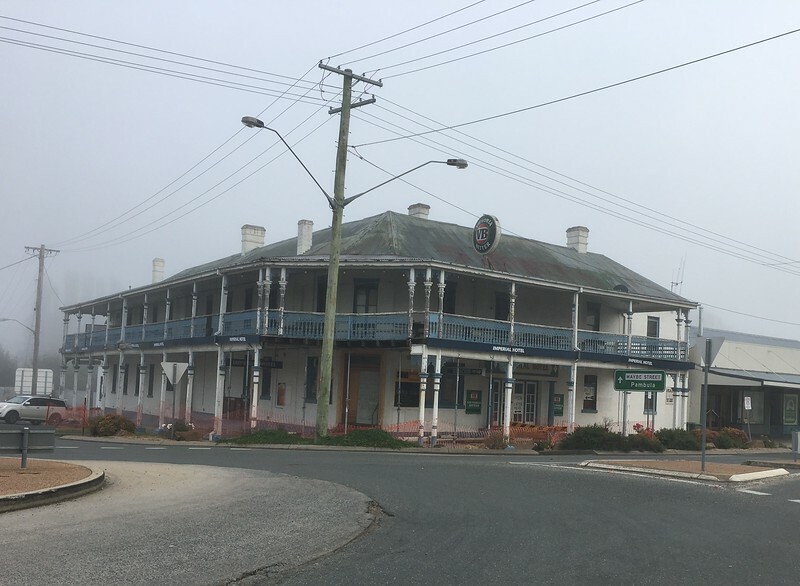 After a huge cooked breakfast that Steve had prepared for us all we headed off from Bombala in fog, which thankfully lifted shortly after leaving town. 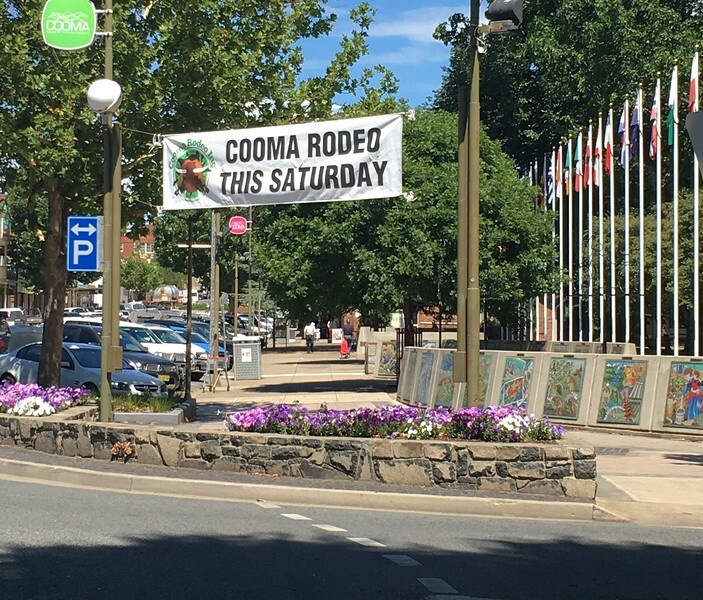 We took a few twists and turns and were in Cooma in no time at all. 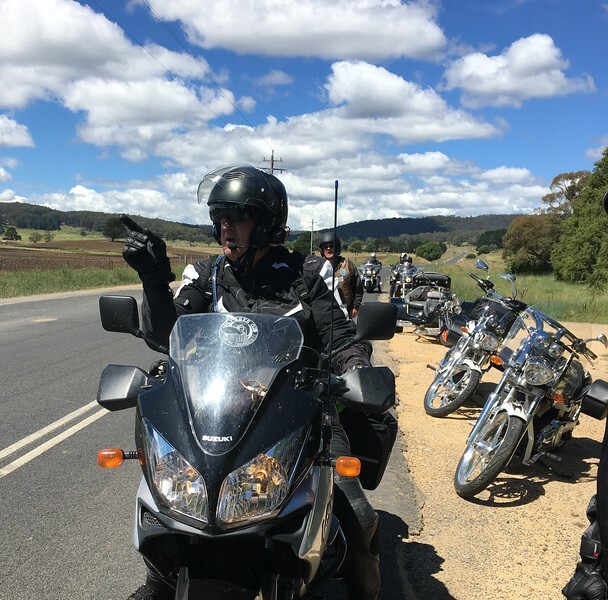 After a brief wee stop and some air in Jim’s front tyre, Gentle led us out of town towards Adaminaby. However, about half way Gentle pulled over with a flat rear tyre. 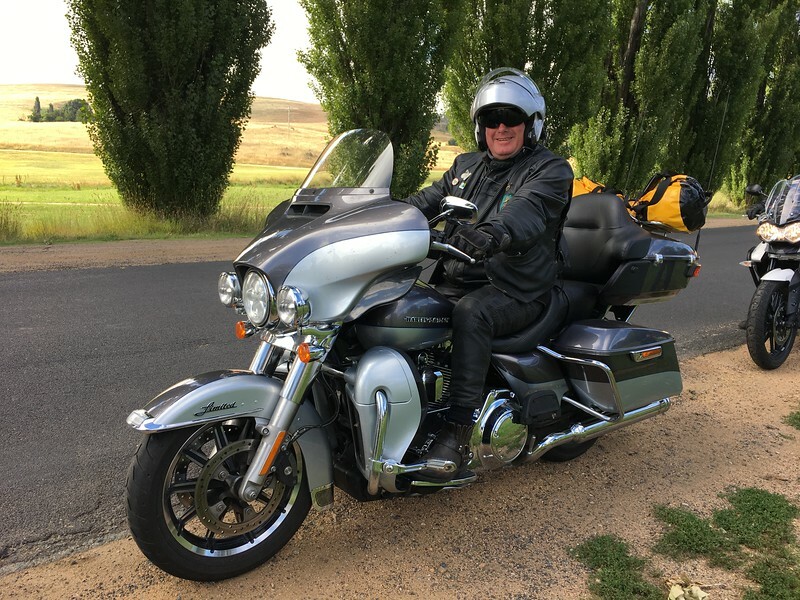 Fortunately it was a torn valve and with Phil’s compressor pump we managed to get enough air into it to get back to Cooma to the motorcycle shop. 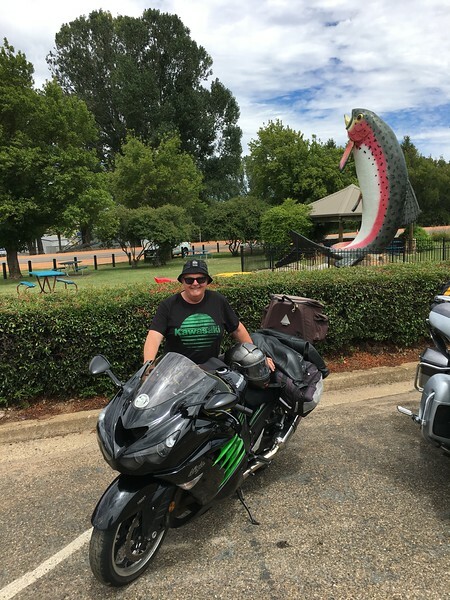 Whilst Gentle’s tube was being replaced the rest of us coffees, fuelled up again and then with tyre fixed, we all headed for Adaminaby for lunch and photos in front of the big trout! 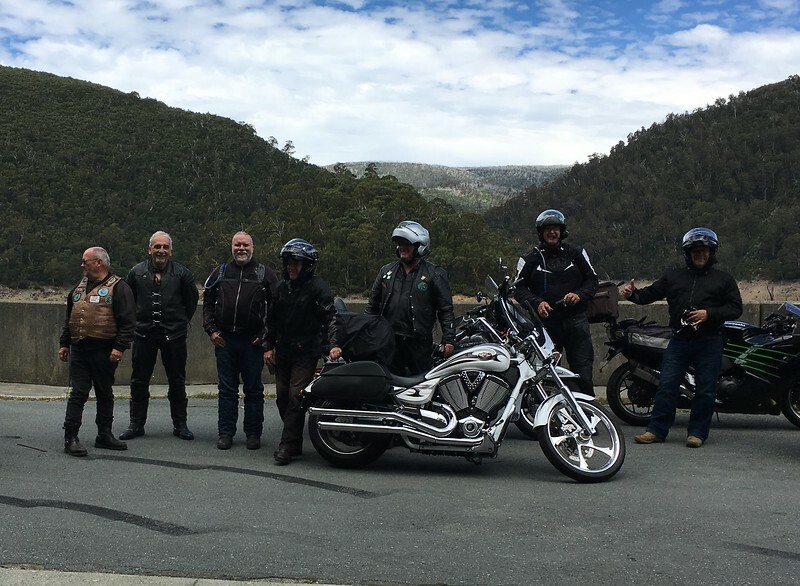 After plenty of banter over lunch we rode the Snowy Mountains Highway in perfect weather conditions and very little traffic. Having spread out a bit we re-grouped and the turn off to the Link Road. From then on the riding just got better and better through the twisties of the Tooma Dam road. At altitude, the temps was only around 23C which made for really enjoyable riding. Again we all rode at a pace that we were comfortable with and re-grouped after descending from the Alpine Way. The temperature had risen to around 30C and felt quite humid. 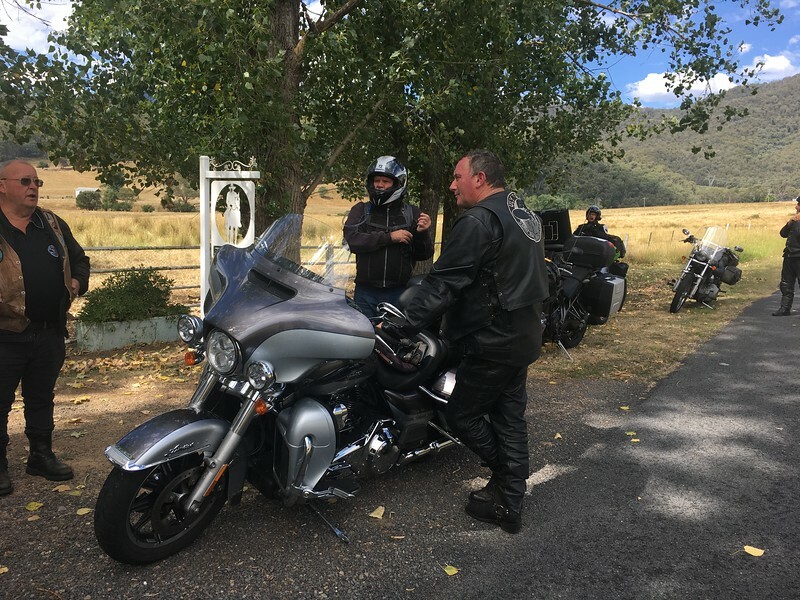 We straggled into Corryong, fuelled up the bikes and headed to our digs at the Corryong Hotel Motel. The rooms were comfortable and spotlessly clean which made for a very good impression. We repeated a now well established post riding formula, namely; out of the bike gear, into the shower, phone calls made and answered and then up to the bar for cool drinks to mark the end of the day’s riding. And what an enjoyable an awesome day’s riding it had been! 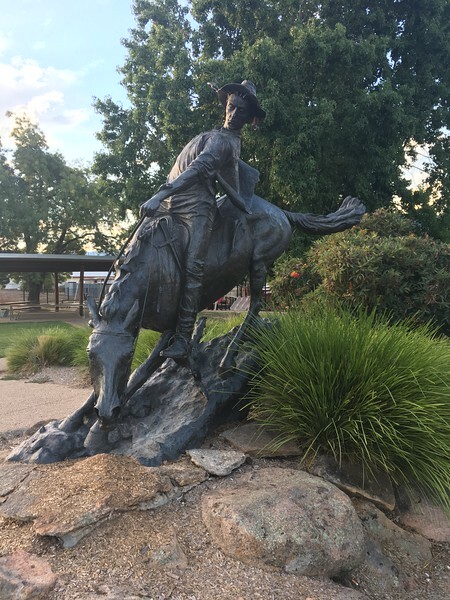 Corryong is proud to be the resting place of Jack Riley, the legendry “Man from Snowy River”. After a balmy night and beautiful sunrise we took off in excellent, still riding conditions. The ride along the Murray River Road was scenic, enjoyable and uneventful. After a gentle run through Granya gap we pulled into Tallangatta for a pit stop. From there it was a really scenic run to Mitta Mitta. 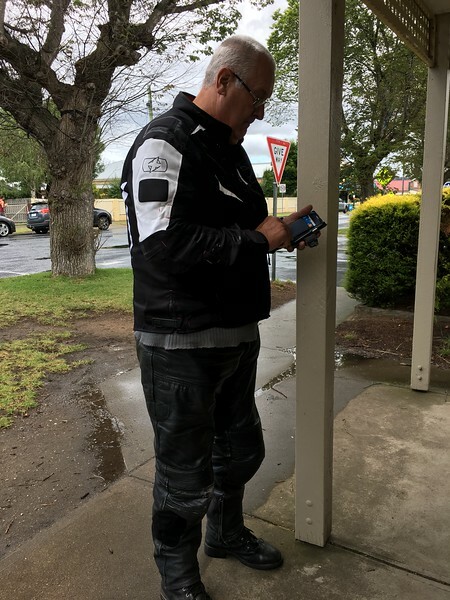 However, in Mitta, Jimbo discovered that he’d left his water filtering drink bottle back at the motel in Corryong. After debating some options he decided to head back to retrieve it. Gentle and Phil said that they’d go along for the ride as well. 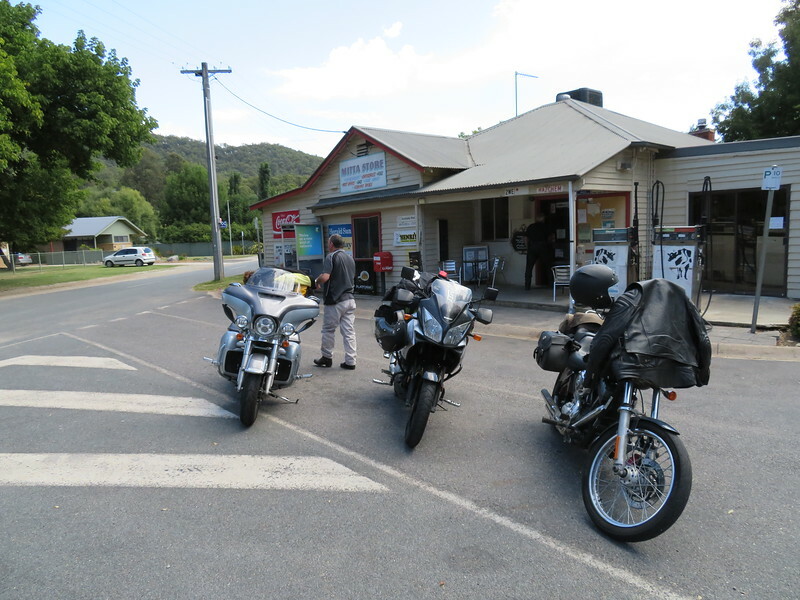 The rest of us had various approaches to the legendry twisties between Mitta Mitta and Omeo. Max had led off a little ahead of the rest of us and wasn’t sighted again until Omeo. 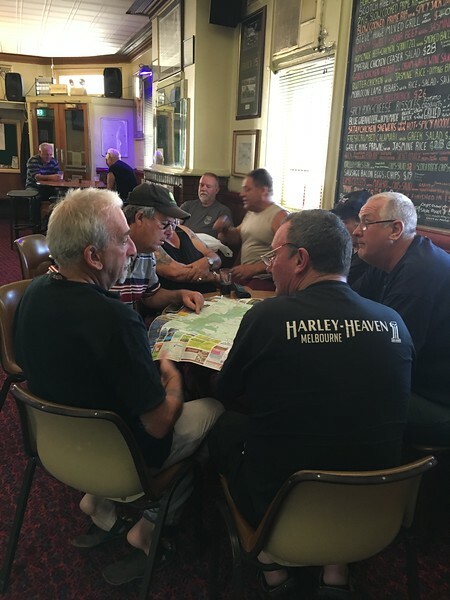 Everyone rode to their capabilities and we met up in Omeo for lunch. 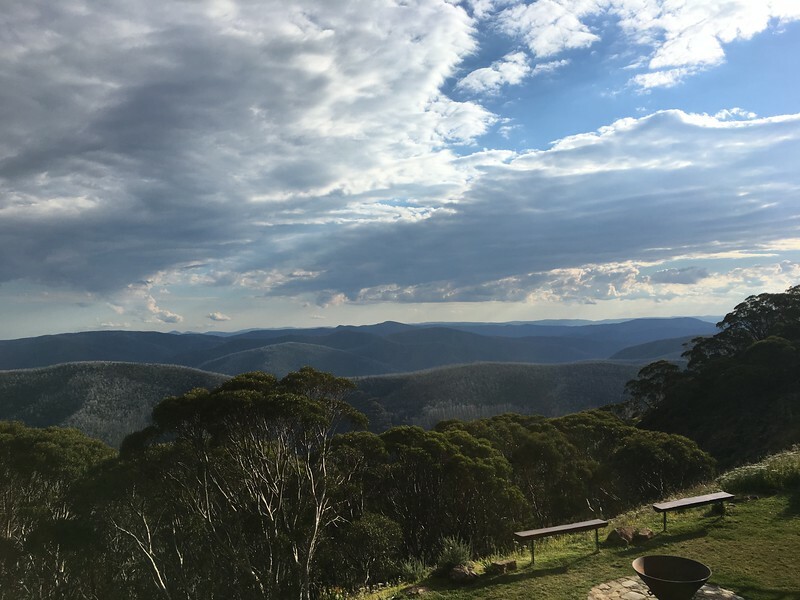 We’d made good time, so after a leisurely lunch, we headed off to Hotham Heights. 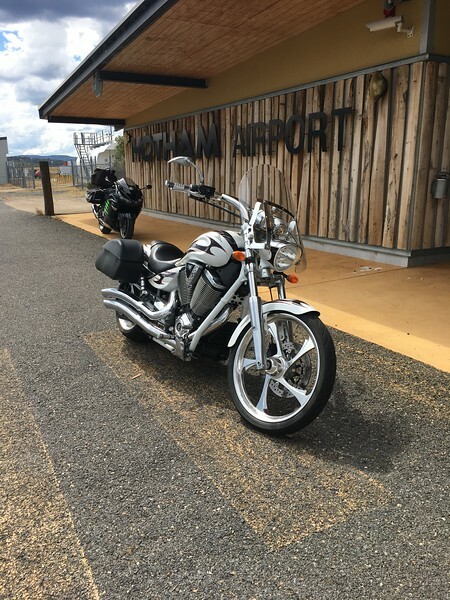 Ron and I detoured to take some pics and have a look around the Hotham airport and Dinner Plain. 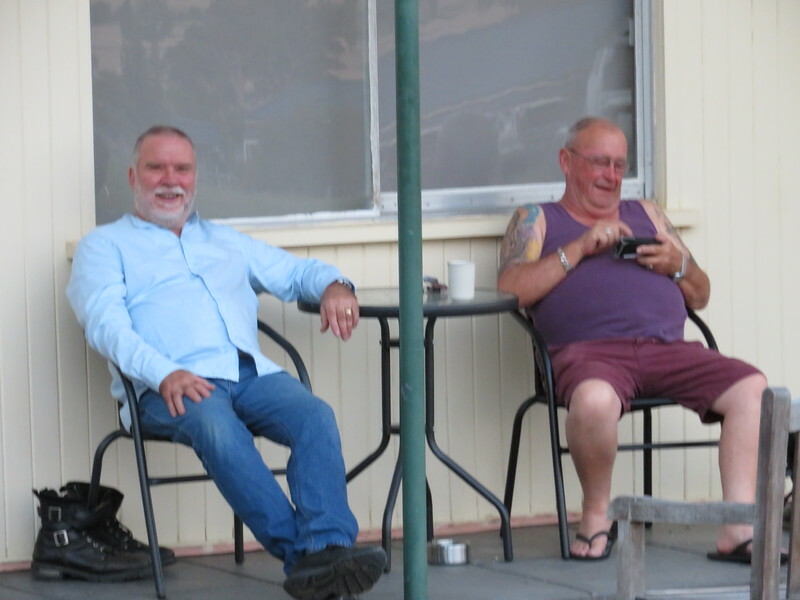 We settled into our digs at Ron and Peter’s lodge, however, we’d had no word from the trio who’d returned to Corryong. 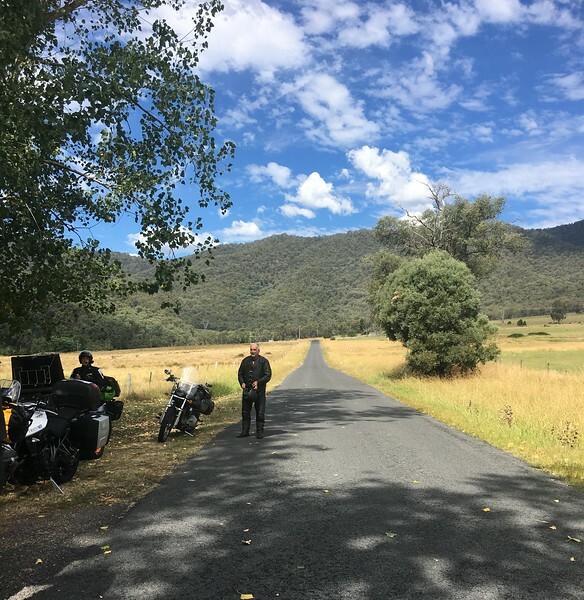 Eventually they rolled in a little after 6.00pm, having also done the Mitta to Omeo run and looking thoroughly exhausted! Alas, the pub at Hotham was our only choice for dinner so we wandered up there for a meal and a few well deserved drinks. Looking out over the mountains from the balcony of the pub was an absolute treat. Again everyone was up are raring to hit the road well before our 8.30am agreed departure time. 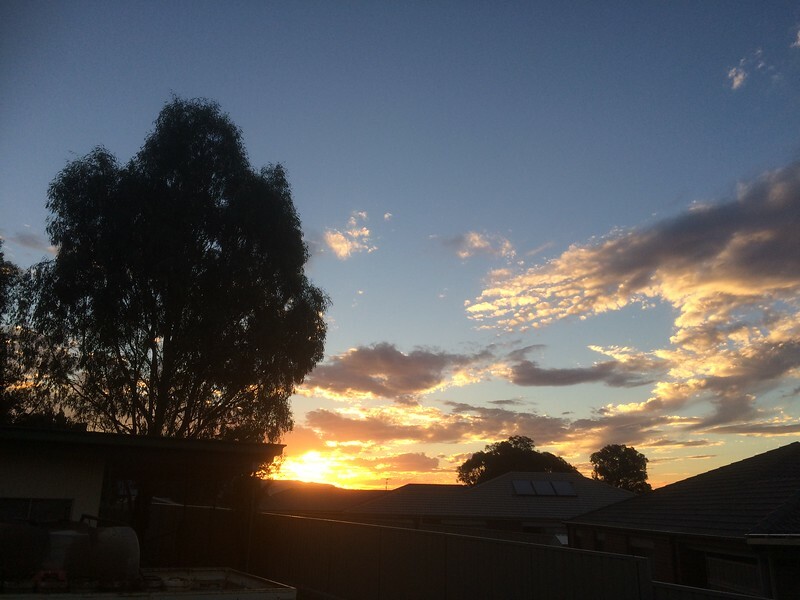 Although the morning air was crisp, the forecast was for 36C. Today was our ride home and we had quite a few kilometres to ride. Normally I look somewhat forward to getting home even after a short trip like this – however, I was genuinely sorry that our trip was drawing to an end. I had a ball riding a mixture of excellent roads in excellent company. We headed off and the road conditions for the descent from Hotham to Harrietville were much better than a few weeks prior when I’d been through here. 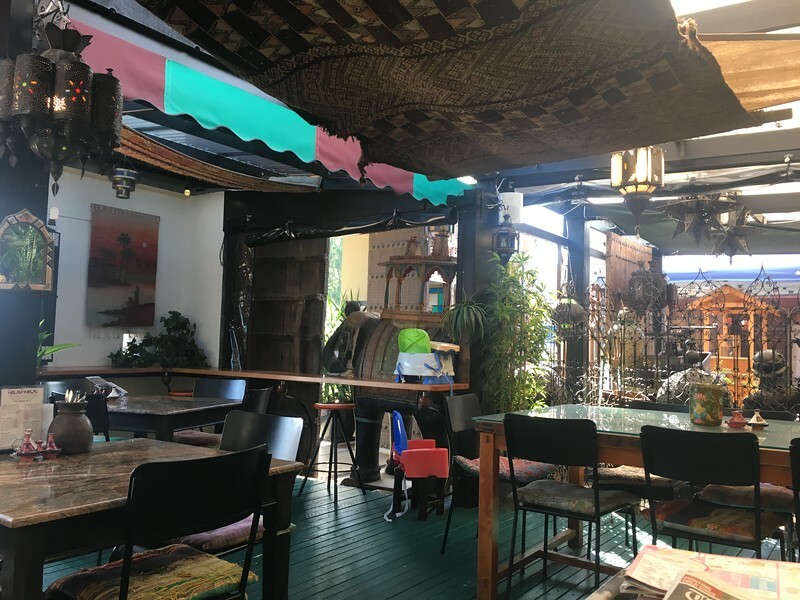 It was a lovely riding down through Bright and along to Myrtleford where we had an excellent brekky at a quirky place called ‘The Fez’. We took a brief stop after an enjoyable run through the King Valley and then the twisties from Whitfield to Mansfield. However, Gentle cracked the whip and we hit the road in no time at all. The cool of the morning was gone and the sun really had some bite. We had lunch in Yea and then said our farewells to the Melbourne fellas. From here on it was a pretty boring run, just grinding out the kilometres in the heat to get home. 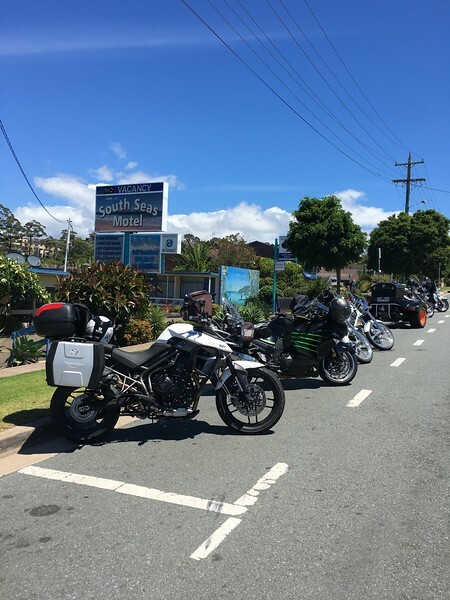 It had been a terrific trip due to the planning and leadership of Gentle, great roads, great weather and a great bunch of fellas to ride with, ensuring that there were plenty of laughs and banter. 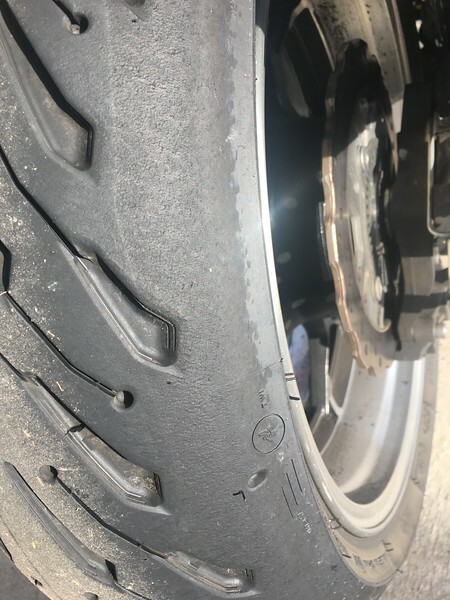 The newest sport-touring tyre from Michelin, the Road 5. I put this on a few days before we left and it performed pretty well. However, it did let go just a little under power in 2nd gear on an uphill hairpin when I clipped the end of a very worn, barely visable, old white line. It certainly got my attention! 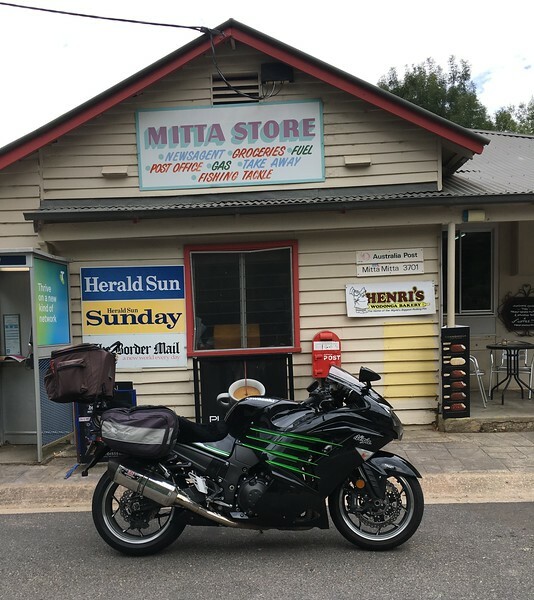 This entry was posted in Kawasaki ZX14, Michelin Road 5, Snowy Mountains, Vic High Country by jcpearce. Bookmark the permalink. Good to see you posting up a ride report, especially after our conversation at PI. A little mojo maybe has returned?? We also stayed at the Orbost Club Hotel last November. I’m with you here I have stayed at some rough pubs before but I’ve also never ever experienced anything like the signs they had put up in their toilet areas, as well as the doozy behind the toilet door. It was clean as you said but I don’t think they need to treat their guests as 12 year olds. None of our crew required the signage advice either. Sad when this is the best of the two pubs in town. 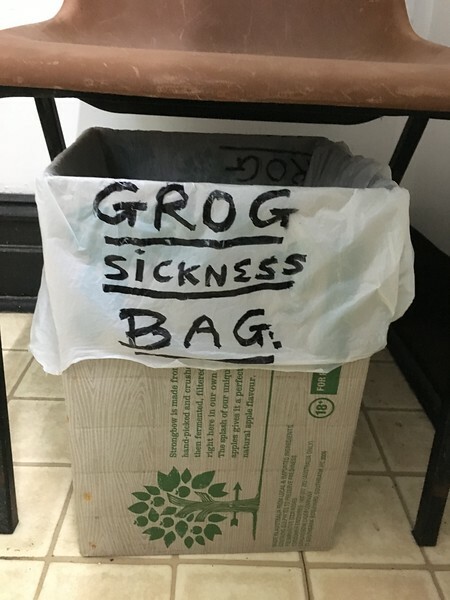 The beer at the other pub was terrible. It’s been awhile since we’ve stayed in the Imperial, but have fond memories of that place and some of them are of nasty hangovers and great times and food. Mojo and time available Steve! Probably next week for the next installment. What date do you fellas hit the road for your Supers & Tassie run? Leaving this thursday for the WSBK and then Tassie after that. Cant wait. We’re not going to the Supers this year. Have a great trip and if you detour to the GOR let me know! Great report, enjoyed all the photos too, thanks for posting. Thanks for dropping bye Warren. I very much enjoy following your travels, however, tend to follow on Instagram more than the blog these days.